Sarcomas can occur anywhere in the body, and they don’t discriminate based on age, gender, race or nationality. Photos of people with sarcoma from around the world. Learn more. Need a splash of hope? Craig Dion was a musician diagnosed with rhabdomyosarcoma. We hope you enjoy his song. For more than a decade, we worked to improve lives by increasing sarcoma awareness and funding high-quality research. This expanded and updated "guide for the whole person" helps new patients and their loved ones to understand a sarcoma diagnosis, seek the best care, manage treatment, cope well and find support. It is featured in the March issue of ESUN. In May and June 2013, the Liddy Shriver Sarcoma Initiative conducted an online survey of sarcoma patients, survivors and their loved ones. 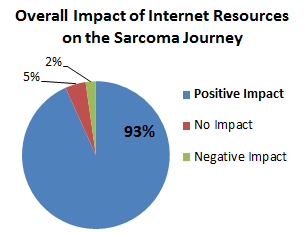 The five-page survey asked 25 questions about the role of the Internet in the sarcoma journey. There were 668 complete responses submitted from 30 countries. In this new report, we discuss the Internet resources available to people dealing with sarcomas, how they are using those resources, and how advocates and medical teams can help patients and their supporters who are actively seeking online information. The Liddy Shriver Sarcoma Initiative is celebrating a decade of service, teamwork and determination. Through the years, we have worked with hundreds of doctors, nurses, patients, families and friends to make a better world for everyone affected by sarcoma. We are grateful for your support, and it inspires us to continue in this important work. A sarcoma is a cancer of the connective tissues, such as nerves, muscles, and bones. Sarcomas can arise anywhere in the body and are frequently hidden deep in the limbs. They are often misdiagnosed and assumed to be sports injuries or benign bumps. Sarcomas are rare tumors, comprising less than 1% of adults' cancers and nearly 21% of children's cancers.1 They are best diagnosed and treated by a team of doctors with experience in all aspects of sarcoma care. Though sarcomas can be aggressive and difficult to treat, many people survive sarcoma. There are more than 50 subtypes of sarcoma, and there are two basic categories of sarcoma: soft tissue sarcoma and bone and joint sarcoma. Soft tissue sarcomas make up less than 1% of all cancer cases. About 11,000 people are diagnosed with soft tissue sarcoma in the United States each year. Primary bone sarcomas make up less than 0.2% of all cancer cases. About 2,900 people are diagnosed with bone and joint sarcomas in the United States each year, and almost half of them are under the age of 35. A patient may see several doctors and have a variety of medical tests before sarcoma is suspected. The diagnosis of sarcoma is usually made with a biopsy, when a doctor removes a small part of the tumor for examination. The decisions involved in the biopsy approach can be complex and are best made by a sarcoma specialist. After the biopsy, a pathologist looks at the tumor tissue under a microscope to make a diagnosis and to determine the tumor's grade (which indicates how aggressive the tumor is). The determination of which sarcoma a patient is diagnosed with should be done by a skilled pathologist with extensive background in sarcoma pathology. Results of the biopsy and other tests are typically used to provide a disease stage (which indicates how advanced the disease is in the body). Learn more about sarcoma diagnosis. Dr. Meyers provides a brief and hopeful introduction to the journey with sarcoma. Sarcoma treatments vary by tumor type, grade and stage, but nearly all sarcomas are treated with surgery when it is possible. The goal of surgery is to remove all disease from the affected area(s). Some low-grade tumors only require surgery, but many sarcomas are treated with chemotherapy and/or radiation therapy in order to prevent or get rid of disease that spreads throughout the body. These treatments may be necessary before or after surgery. The duration and intensity of sarcoma therapy can be surprising and disheartening to patients and their families, and coping with the side effects of treatments can be a challenge. Many patients and their families choose to join support groups, which can be a great source of information and strength. Families can also seek counseling and support services at cancer centers and local charitable organizations. Learn more about sarcoma treatment. As opposed to most types of carcinoma, there is really no time when "cure" is felt to have been definitively achieved. Sarcoma is a lifelong diagnosis, and should be treated as such. Having said this, most recurrences or metastases will be discovered within the first two to five years after treatment. Once the patient has cleared the five-year mark, the risk of recurrence diminishes greatly, but still certainly exists. Because sarcomas can return long after an initial diagnosis, survivors have regular check-ups for many years after treatment ends. Some of those survivors choose to share their stories to encourage others. 1. Burningham, Hashibe, Spector and Schiffman. The epidemiology of sarcoma. Clinical Sarcoma Research. 2012 Oct; 2(14). Here You Will Find Much Helpful, Hopeful Information. SarcomaHelp.org provides professionally reviewed information about sarcomas and their treatment. Because we've been publishing articles written by sarcoma specialists and advocates for nearly 10 years, there are many articles to discover. We have done our best to present the information in ways that make it easy for our visitors to read and understand. Ultimately, we hope that this website will empower you. The knowledge gained here can help you and your loved-ones to communicate well with each other and with the doctors and nurses who deal with sarcomas. 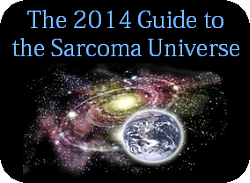 We consider the pages listed above to be essential reading for everyone dealing with sarcoma. If you find yourself overwhelmed by the amount of information in these articles, please bookmark this site and return when you are ready to learn more. Sarcomas are a group of rare diseases, and different sarcoma subtypes behave in different ways. We encourage you to learn about the specific subtype of sarcoma that is affecting you or your loved-one. You might also use our site search engine to find information that can help you in your sarcoma journey. Find Inspiration - Feel Less Alone. Consider reading some of the creative writing and stories that have been published here by sarcoma patients, caregivers and survivors. Learn about our Research Grants Program and the global Team Sarcoma movement that has increased sarcoma awareness and funded groundbreaking research. Look through the archives of ESUN, a source of sarcoma news, articles and event announcements for 11 years. 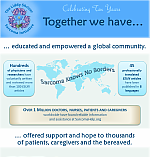 There are many ways to reach out and come together with people around the world who are dealing with sarcomas. Check our our list of sarcoma resources for finding support groups, financial assistance, and help for children and young adults.